NOTE: This is the first of four parts of a discussion, originally written in 2007, of some the science the shows up in Against the Day. Thomas Pynchon is known for his dense and often obscure references to history, pop-culture, and especially science in his novels. His novel Against the Day is set around the beginning of the 20th Century, a time when our understanding of space, time, and light, rooted in classical physics, was completely overturned and replaced by a revolutionary new perspective based on the theories of special and general relativity. Pynchon takes the science of this period and incorporates it deeply into the language and structure of Against the Day, more so perhaps than in any of his other novels. Against the Day is suffused with meditations on light, space, and time, and often plays with the tension between different perspectives in math and physics – classical physics versus relativity, or Maxwell’s laws of electromagnetism described with the imaginary numbers of quaternions versus the real numbers of vector analysis. This material is not just filler – it’s critical to the core of Against the Day, a fact which has been underappreciated in early reviews of the novel. One reviewer claimed that a new generation of writers has a “grasp of the systems that fascinate Pynchon — science, capitalism, religion, politics, technology — [that] is surer, more nuanced, more adult and inevitably yields more insight into how those systems work than Pynchon offers here.” When it comes to science at least, this claim is absolutely not true – Pynchon’s achievement in Against the Day proves that he is peerless at deeply and knowledgeably working the most abstract scientific subjects into the context of our common humanity that is the ultimate concern of his novels. My goal here is twofold: First, to illustrate how Pynchon goes beyond using science as simply a backdrop, or a way to show off his amazing erudition – he weaves scientific concepts into the language and structure of his book better than any other author working today. Second, I’ll lay out a primer on the basic scientific ideas so that readers of Against the Day can make their own discoveries about the novel. I cover four main topics: (1) the Michelson-Morley experiment and the breakdown of classical physics, (2) space-time and special relativity, (3) the development of vector analysis and the eclipse of quaternions (I’ll give you my guess of the ‘Baedeker’ that Pynchon ‘looted’ for his material on quaternions and vectors), and finally, Riemann surfaces. These four topics cover most of the scientific references in Against the Day. Pynchon, clearly being a sucker for historical trivia, is mindful of the chronological development of these subjects, so I’ll cover most of them from a historical perspective, including some famous, now-rejected explanations proposed for the negative result of the Michelson-Morley experiment. It is also important to note the science Pynchon did not include in the novel – other important advances were being made at the time by some of the same scientists featured in the book, but Pynchon hardly mentions them – most notably those in statistical mechanics (and yes, entropy) made by J.W. Gibbs. In this book, Pynchon has chosen to focus on space, time, and light. 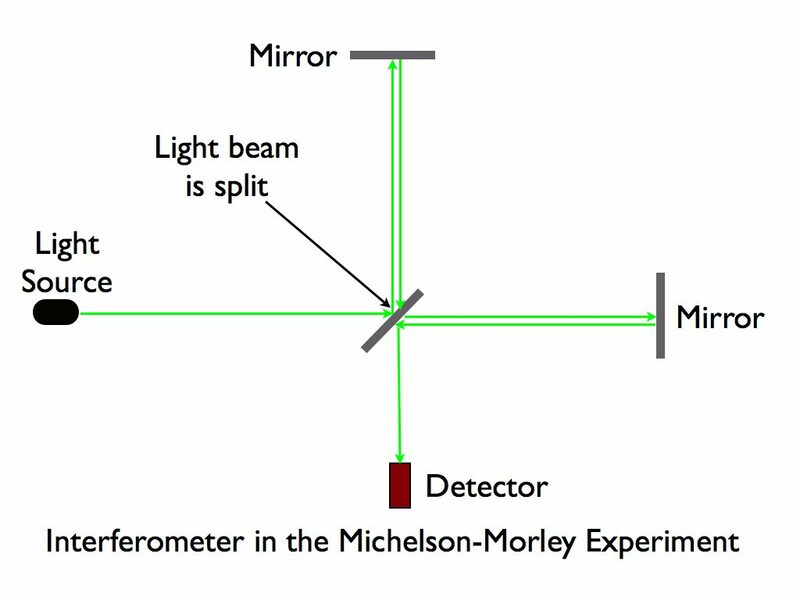 The Michelson-Morley experiment (actually, a series of experiments performed over several years) was one of the definitive experiments providing physical evidence of the inadequacy of classical notions of space and time. The attempts to deal with the negative results of this experiment eventually led to Einstein’s theories of special and general relativity, which are based on a completely different and very strange new way of viewing space and time. This new outlook has since been proven beyond any doubt, by decades of experiments. easily sensitive enough to definitively answer the question he was posing. The negative outcome of this experiment was a major stepping-stone towards the development of a new understanding of light, space, and time. To see how this new understanding arose, we have to first understand the questions in classical physics that led to the Michelson-Morley experiment. Albert Michelson began his famous series of experiments because the laws of classical physics, which in general were spectacularly successful, were running into trouble in one critical area: moving reference frames. Although we not may use the term ‘reference frame’ very often, we deal with moving reference frames in our everyday experience. As we have all experienced, Newton’s laws of motion don’t depend on whether we’re on the ground or in a vehicle moving at a constant speed. (Constant here is an important qualifier.) For example, you can play tennis on a steadily moving (that is, non-accelerating) cruise ship just as easily (or not so easily, in my case) as you play tennis on land – you handle yourself and the tennis ball the same way. Or, if you’re on a steadily moving (again, non-accelerating) train, you can bounce a ball against the floor, and it behaves just as if you were bouncing it on the floor of your kitchen back home. The ball bounces straight up and down, keeping up with the train as you bounce it, as long as the train does not suddenly accelerate. From your perspective, or reference frame on the train, Newton’s laws of motion, which govern the movement of the ball you are bouncing, are exactly the same as they would be if you were standing outside on the ground. Newton’s laws apply equally well to moving and stationary reference frames (as long as the moving frame is not accelerating). To someone standing on the ground outside of our hypothetical train, watching you bounce the ball as you go by, the situation looks a little different, but is still completely in accordance with Newton’s laws. This outside observer sees that the ball isn’t going straight up and down; it’s also moving forward with you and the train, nevertheless, the ball is also obeying Newton’s laws from this outside perspective. All of this is common sense and intuitively obvious to us, but one can also show that it works out mathematically as well. While this phenomenon is true of Newton’s laws of motion, the classical laws of electricity and magnetism do not hold in different moving reference frames. To see what this means, we can use one key example: light. Maxwell’s classical laws of electromagnetism imply that the speed of light is constant (that is, constant in a given medium like a vacuum – light moves at different speeds in different substances like water or air). If we simply treat light the way we treated Newton’s laws in our above examples of the cruise ship or the train, the speed of light would not be constant for observers in different moving reference frames. If I’m standing on the ground watching a pulse of light go by, I would see that it’s going at 300,000,000 meters per second (m/s). Someone on a train moving at 50 m/s, watching that same pulse of light go by, would perceive the light to be moving at 299,999,950 m/s. (This difference is of course, too small to be perceptible to unaided human senses.) In this case, the speed of light, unlike Newton’s laws, is not constant for observers in different reference frames, and thus the laws of electromagnetism would be different, depending on your frame of reference. Physicists in the late 19th century were well aware of this conundrum. They believed that there had to be one universal frame of reference where the speed of light was constant in any direction, in which Maxwell’s laws of electromagnetism were perfectly valid; all other objects in the universe moved relative to the absolute space of this universal reference frame. This was called the aether frame of reference – aether was the stuff (although what kind of stuff, nobody knew) through which light supposedly propagated, much like sound must propagate through air or some other medium. On this theory, the earth must be moving relative to the stationary aether, much like a train moves relative to the ‘stationary’ earth. If this was in fact true, that the earth moves relative to the aether, then this movement should be detectable by experiment. And here is where Michelson and Morley come in. Albert Michelson (who, like many characters in AtD, grew up in a mining town) and Edward Morley developed an extremely sensitive instrument to measure the speed of the earth relative to the hypothesized aether. The reasoning behind the experiment goes something like this: if light propagates at a constant speed through the aether (at 300,000,000 m/s), and if the earth moves at a certain speed relative to the aether (at, say, 30,000 m/s), then light moving in the same direction as the earth should appear to move more slowly to an observer on the earth – the speed of light in the aether, minus the speed of the earth. It’s like driving on the highway – if you are going 60 mph and driving behind a car going 90 mph, then from your perspective the car in front is moving away from you at 30 mph. Michelson and Morley measured the speed of the earth relative to the aether and came up with a disturbing result – relative to the aether, the earth was not moving at all. I’m won’t describe exactly how the Michelson-Morley experiment worked – good explanations can be found in a physics textbook or a Google search. However, the basic setup of the experiment has a connection to some of the plot structure in AtD, as well as to the book’s themes of double refraction and bilocation. In the experiment, a light beam is split into two separate beams, which travel away from each other at a 90˚ angle, are reflected by mirrors, and then travel back and meet up, at which point they are either in phase or out of phase with each other (see the diagram below). If the earth is moving relative to the aether, the different light beams will travel different distances, and come back out of phase with each other. Returning to Michelson and Morley – the results of their experiment were negative. They could detect no movement of the earth relative to the aether. Over the next several decades, scientists came up with various explanations for the negative result. One explanation offered (mentioned in AtD) is that the earth drags some of the aether along with it (and thus the earth isn’t moving relative to the dragging layer of aether, so you don’t detect a change in the speed of light). One of Pynchon’s characters draws an analogy between this explanation and the dimples on a golf ball, and the lift of the golf ball through the air and the lift of the earth through the aether. One possible solution to handle the negative result of the Michelson-Morley experiment was to try to modify the laws of electromagnetism. Maxwell’s equations were quite young compared to Newton’s laws, so it seemed obvious that the problem would be with Maxwell and not Newton. However, it became clear that Maxwell’s laws were in fact correct, and eventually (as Einstein’s theory of special relativity was accepted), that light traveled at a constant speed in any non-accelerating reference frame – not just in one universal aether reference frame. This means that whether you are standing on the ground or traveling at 100,000,000 m/s in a (currently fictitious) space ship, a light pulse will always appear to be traveling at 300,000,000 m/s. To go back to our highway analogy – you’re going 60 mph behind a car going 90 mph, and instead of appearing to move away from you at 30 mph, the car appears to be going 90 mph away from you. The implication of this very weird fact about light is that our everyday ideas about space and time are not correct. Maxwell’s equations weren’t the problem – Newton’s laws were. The physicist Henri Lorentz, between 1895 and 1905 proposed that objects in motion experience length contraction and time dilation, a proposal (in mathematical form) which could account for the negative results of the Michelson-Morley experiment. In a nutshell, his proposal was that as you move faster and faster, space (from your frame of reference) shrinks in certain directions, and time slows down. If you go through Lorentz’s math (known as the Lorentz tranformation), you see that space and time components in one reference frame, get mixed together when you move to a different reference frame – space and time are not separate; they depend on how one is moving. We can think about this by drawing an analogy with the video game Frogger. In the game, you get a frog across the road by moving it left, right, up, or down. Now, imagine it this way – instead of having the frog face directly across the road, it’s rotated at a 45˚ angle to the right, facing diagonally across the road – the frog’s reference frame has rotated. ‘Up’ now (in this reference frame) is the equivalent of some ‘up’ and some ‘right’ in the original reference frame. ‘Up’ in one reference frame is a mixture of ‘up’ and ‘right’ in another. So how we perceive space and time depends on how we are moving. (Does the eternal youth of the Chums of Chance somehow depend on their motion?) But no matter how we move, no matter what our reference frame, light moves at the same speed for all of us. In Part 2, I’ll discuss special relativity and space-time, the new outlook that replaced the old worldview of classical physics. Modern Physics for Scientists and Engineers, by John Taylor and Christopher Zafiratos. The Fabric of the Cosmos, Brian Greene. I love this stuff. A good explanation of the way Pynchon’s characters can behave either randomly or following free choices that make sense to them but are really (maybe?) following rules and patterns unknown to them. They do what they have to but never truly know why. They just think they do. Looking forward to next parts. Especially quaternions. It seems to me that the theme of bilocation/doubles in the book is a key example of what you’re talking about – characters following rules (e.g., doubling & being in or out of phase like Michelson-Morley light beams) that they aren’t aware of. Will try to get the next parts posted soon – this was an incomplete project from 2007, so I need to refresh my memory a little & tie up some loose ends. This reminds me that when you read Pynchon you enter his universe and play by his rules. The only question is are they real or just his? But I guess his are as good as any. also: please post the “other parts”! fantastic – i keep wanting to make a map to course all the movements of the main characters … vector overload! … i just really want to see the shapes that it create. this post makes so much sense, i’m reading AtD for the second time, and as usual with pynchon, lots of material reads with greater clarity. this analysis has added another dimension to the clarity. i kept thinking in this reading that the realm of bilocation and doubling is more tangible on the second read, so it is exciting to see discussions of this here. thanks for posting. There is so much in the book to follow up on. How this science ties into the theme of bilocation throughout the book is a huge, unexplored theme, ripe for further investigation. I have the next part ready to go and will post it soon. I got part way through my intended third part a few years back, and am now struggling to figure out where I was when I left off – but I will keep at it. Thanks for reading! Is this from Adaptive Complexity? I found that blog right after the first time I read Against the Day. I always wanted more. I still do. I’ve been through the book twice now, and can’t wait to get the time for round 3. So much is revealed in this work. Please, finally get to the subsequent parts of your analysis! O! the quaternions! Yes, I originally posted these on Adaptive Complexity way back when… then I moved my blog, other things happened… and now it’s years later and I still haven’t finished! Because of my cryptic notes I wrote to myself back then, it’s taking longer to get back up to speed on the science and math. But summer vacation is coming up soon, and I hope to get the next installments finished. Thanks for reading… and waiting!